Alliance, Ohio team leader Molly was on hand to help our neighbor Silas and his parents, Mike and Kate, prepare for a new and very important addition to their family. First, we have to tell you a little bit about our young neighbor Silas and his best friend! His new buddy, Abbott, is a fully-trained service dog from 4 Paws for Ability. Three-and-a-half-year-old Silas has suffered from severe epilepsy since the age of three months and has experienced a couple of developmental delays due to his premature birth. Abbott is trained to detect Silas' oncoming seizures and protect him from harm during them, and provides other assistance as well. Before Abbott became part of the family, Silas and his parents decided that they should go out shopping to get their new family member a bone. So, they headed off to our Alliance, Ohio pet center for a full Pet Supplies Plus shopping experience! Silas' parents, Mike and Kate, consulted their friend and pet center team leader Molly for some badly needed dog-owner hints. 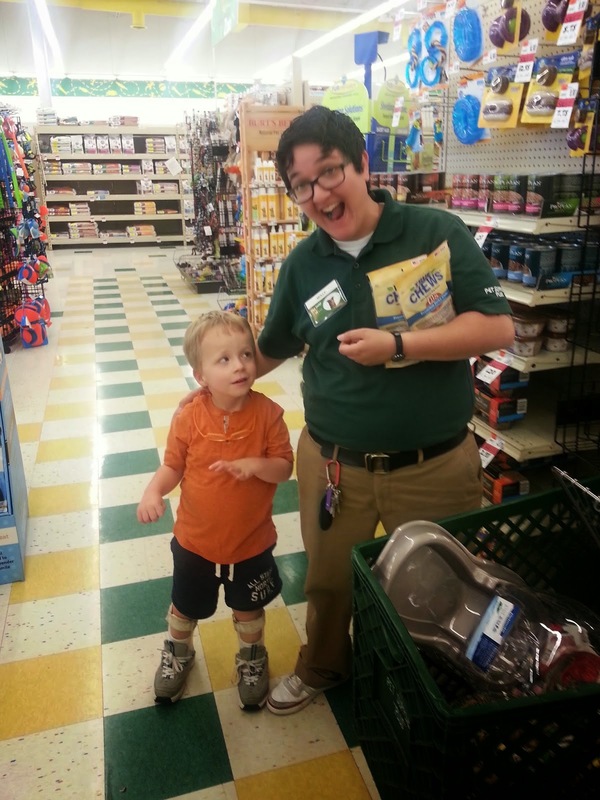 "We have not owned a dog in our adult lives, so we really needed some guidance on what to purchase," Kate wrote. "Thank goodness Molly was there to give us tips on everything from treat caddies to tick checks!" Molly was able to help Mike and Kate with all the basics. And, of course, Molly was able to help Silas pick out the most important thing for Abbott: "He was very interested in selecting the Nylabone for his pup," said Kate. "All morning, when asked where we were going, he said, 'Shop . . .bones!'" Molly offered some knowledgeable and trustworthy service to Silas and his mom and dad, and was rewarded by knowing that she helped the family proceed confidently in welcoming Abbott into their lives! You can read more about Silas and Abbott on mom Kate's blog and check out the PSP shopping story here.